This afternoon, First Citizens Bank held on to the token sum of TT$300 from the Trinidad and Tobago Football Association’s (TTFA) eight accounts at the financial institution—for banking and maintenance fees. The local football body’s remaining money, TT$270,871.33, is now property of 15 former National Futsal players and their five technical staff members and attorneys. This morning, Master of the Court Sherlanne Pierre instructed First Citizens Bank, represented by attorney Shashi Seecharan, to immediately make the payment to the claimants as part settlement for an award of over TT$500,000, which the TTFA should have paid since 13 December 2018. 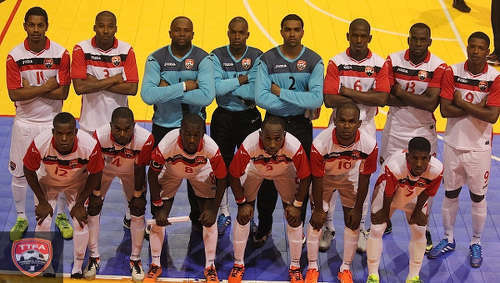 Photo: The Trinidad and Tobago National Futsal Team pose for a photograph before their CONCACAF Play Off match against Honduras in May 2016. The successful Futsal players listed in the action are: captain Jerwyn Balthazar, Kevin Graham, Adrian Pirthysingh, Colin Joseph, Kerry Joseph, Jameel Neptune, Ishmael Daniel, Anthony Small, Kevaughn Connell, Keston Guy, Kareem Perry, Jamel Lewis, Noel Williams, Bevon Bass and Cyrano Glen—whose elder brother Cornell Glen was one of 13 Soca Warriors who successfully sued the TTFA in the landmark ‘2006 World Cup bonus dispute’. 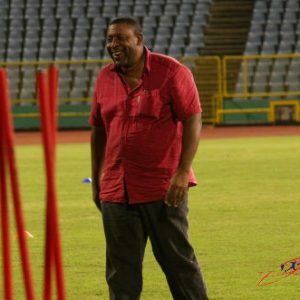 The technical staff members are: Clayton Morris (head coach), Sterling O’Brian (assistant coach), Perry Martin (goalkeeper coach), Brent Elder (trainer) and Ronald Brereton (manager). The TTFA, whose legal actions are dictated by president David John-Williams, also owe costs to the Futsal Team’s attorneys, Keston McQuilkin and Melissa Keisha Roberts-John. John-Williams did not appear in court today and his vice-president, Ewing Davis, represented the football body. Morris, Elder and Brereton turned up to represent the Futsal contingent. The claimants were stunned to learn that the TTFA banked US$600,000 or TT$4,000,000 from FIFA between mid-December 2018 and January 2019. However, by the time the Futsal Team had a garnishee order accepted by the court on 18 March 2019, the TTFA had less than seven per cent of that largess left in its accounts; and nothing besides. The TTFA’s office staff of roughly 15 persons, minus its technical director, is paid an estimated TT$90,000 per month—which would account for just TT$180,000 (two months’ salary) from the money received via the FIFA Assistance Programme. So where did the rest go? 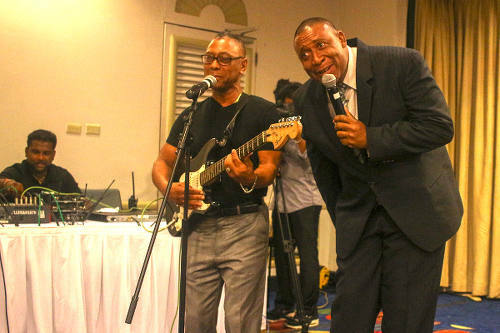 Photo: TTFA president David John-Williams (right) performs a duet with former Calypso Monarch, Cro Cro, at the launch of the National Elite Youth Development Program at the Trinidad Hilton on 14 October 2016. 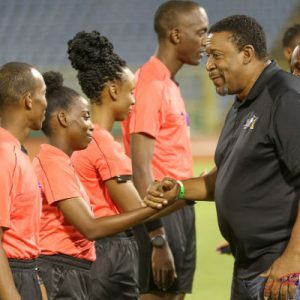 The Futsal Team were particularly dismayed as John-Williams, through attorney Annand Misir, allegedly promised to pay them from the FIFA funding, only to go back on his word. “At the time of the judgment [on 13 December 2018], the attorneys on behalf of the TTFA indicated that they were getting money from FIFA,” Brereton told Wired868, “and they said when that money comes they will pay us. So they asked if we would give them 28 days to pay. The court also learned of an alleged US$24,000 payment from Concacaf to John-Williams, which was sent to the TTFA’s bank account. The attorney for the football body argued that this sum should not be handed over since it was the president’s money. However, with no paperwork to substantiate the claim, the Master dismissed the TTFA’s request and offered that sum to the claimants as well. The football body must also pay costs to the Futsal Team’s attorneys for having to return to the courts. 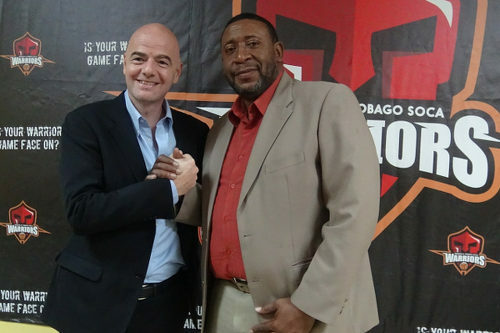 Photo: TTFA president David John-Williams and FIFA president Gianni Infantino at the TTFA headquarters on 27 January 2016. It is a process that will likely be repeated until the initial judgment is satisfied. Wired868 can confirm that the TTFA’s office staff have not received salaries for March, nor have they been told when to expect payment. At the end of the day, what does this show our young people? Toco Nicky therein lies the ultimate concern! Toco Nicky when yuh get in power, enrichen yuhself and yuh doh have tuh listen tuh nobody. Do whey yuh want! Keith Look Loy does this Guardian reporter ask any tough questions or is he comfortable being a “mouthpiece” for the TTFA President? Keith Look Loy omg. This cockroach never gives up. If he had nothing to hide he could have answered any critics long ago but he remained arrogant, secretive and dictatorial and brought all of the problems on himself and the organisation. If he had anything of worth to say or a ‘secret’ we haven’t heard why on earth didn’t he reveal it before. Whatever it is he says now it is TOO LATE! 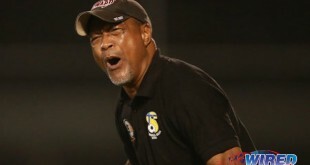 Now he needs to get the f..k out of the way and let Football in T&T recover. Brian Jordan Read the lines and between the lines bro. Keith Look Loy fool’s comforts are any promises King David makes. Ent he promise de court to comply with the records requests? Ent he promise tuh pay de Futsal team? Ent he did promise tuh usher in integrity and accountability at the TTFA? I eh taking no basket from Promise Pete, nah.